Here is an interactive session with Rohaan Pajnigar and Pulkit Chaturvedi, the speakers of the team that won ‘Checkmate- The Army Institute Of Law National Moot Court Competition-2014’. The team comprised of Rohaan Pajnigar, Pulkit Chaturvedi and Arushi Lohia, second year students of Symbiosis Law School, Pune. This was Rohaan’s very first moot and Pulkit’s second and they totally nailed it. Read on to know how. 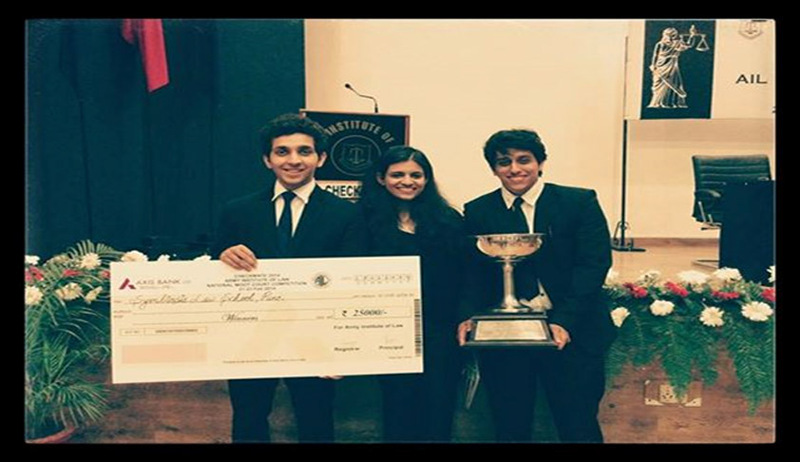 Live Law: Winning the very first moot that you have ever been for is a mammoth achievement! What transpired through you to select just the correct moot? Pulkit- This was my second moot, the first one being B.R. Sawhney moot organized by NALSAR where unfortunately we could not do very well. It was our hard work that it proved to be the correct moot. I personally selected this moot because it was a criminal law moot and the problem was so interesting. Also, Army Institute of Law and the Moot- Checkmate are both very reputed and such an exposure would be great for us. Rohaan- The way this happened was that we had to send in our biddings because of the online moot bidding and because of that I did not really know if I was going to get the moot or who my teammates would be. I must say that I got outbid in quite a few moots. So when I sent in my application for this one I was quite shocked to have got it, so far as selection goes didn’t really think about it. Live Law: How were your initial reactions to the moot problem and the whole process of spending sleepless nights preparing for it? Pulkit- When I first read the moot problem; I started going through the criminal law provisions which were included in it. Since we hadn’t studied that much of criminal law by the time we were selected to go, we basically had to start from scratch. We started by reading the Bare Acts for it, and the authoritative commentaries on the Indian Penal Code. All three of us used to sit down in the library everyday till 8 in the college, go back to our places, have dinner, and by 11 Rohaan and Arushi used to come over and there the process of working began again till 4 in the morning. Sleepless nights preparing for it actually helped us bond so much that all three of us are now so close and have become such good friends. Rohaan-Initially I thought the moot problem was not that hard. But the sleepless nights came about when the drafting began and when we actually dwelled into the problem and started analyzing it fully, then we realized the intricacies and that it was more than what met the eye. Sleepless nights are not something I’m fond of but it had to be done. It was tiring and grueling, but in the end it was all worth every minute we put in. Live Law: How was the coordination within the team? Was the goal more important than the role? Pulkit- All three of us are from the same division and the same year, it was easier for us to coordinate than it is for the other normal teams. We had the same internal exams, the same study pressure so we all divided the work within each other so that the moot doesn’t affect anybody’s internals and academics. Yes for us, the goal of winning the moot was way more important than the role played by each other. There were a number of occasions where one of us was not available to work, the other two assumed the role of that person and it was very apparent that our main aim was the goal of winning the moot. Rohaan- Our team coordination was pretty good, which I think is important. Pulkit did an efficient job in assigning roles and tasks between us. Arushi was the headstrong one I would say who always brought Pulkit and me back on Earth whenever we thought we were getting ahead of ourselves. She would show us the reality of things and that we had a lot of more work to do to be at the top of our game The goal of winning was the mark,but the doing well of the roles and your part gets you to the goal,so I think yeah both were important. Live Law: How was the competition there? Does luck play any role in winning a moot? Pulkit- It was very cut-throat competition there. We had to compete with 35 other teams, which included the top national law schools who had sent their able Mooters. The format of the moot was such that one loss in even one round can throw you out of the competition, therefore we had to perform our top performance in every single round. After the pre-lims, only 8 teams were supposed to qualify for the quarter finals out of the 36, 11 teams had won both their rounds at the pre-lims so it ended up 3 teams being losing out on the quarter’s birth on the basis of points even after winning both their rounds. Defeating top teams like Amity Noida, Amity(IP university), Jindal, NLIU and NUALS(Cochi) speaks about the amount of competition there. We were very lucky that we got the sides whichever we wanted in every round that we went for and thus we were very lucky in that sense. Rohaan- The competition was pretty good, I felt it could have been tougher but it was not bad. We came up against quite a few good teams after we qualified. Colleges like Jindal and NLU Bhopal gave us a tough fight. As far as luck goes it does a play role I feel, because luckily we got to argue defendant side of the case throughout the integral part of the competition, which was the stronger side of the case due to the virtue of the moot problem and facts itself, and this choice was brought about absolutely by luck by way of draw of lots. Live Law: Mooting is seen as a tiring exercise by several who haven’t given it a shot yet. How will you convince them otherwise? How did you cope up with the pressure? Pulkit- In my opinion, this is one activity which will show and prepare you for your future advocacy career and give you the confidence and the experience of pleading. Mooting is also the best and the most fun way to know the Law because you may learn the law for the exams, but you can only know it if you moot. Maybe the act of not taking the pressure on us actually helped us to go and win the moot.As Charlie Sheen’s tagline goes, and so were our teams “Whatever Happens there, We’re Winning. WINNING." Rohaan-Even I share the opinion of Pulkit. It is tiring, slow, painful and horrid to do. The amount of hours you have to read, figure, analyze, research is brain sapping and exhausting. You will definitely curse yourself for taking up this task once you get into it and you will definitely curse the framer of the moot several thousand times for sure. But the fruits of all the hard work are realized when you can face the judge undeterred in the court and argue like you framed the law itself. That feeling of unquestionable confidence is one which is truly a great feeling to have. So those who have never done a moot I say give it a shot,some might love it,some might not but it’s definitely worth giving a shot. Live Law: Being the brand new entrants into the mooting arena, what’re the future plans now? Rohaan- As of now I hope to take part next year in a moot. Pulkit- Well, my future plans to participate more National and International moots and my dream is to eventually win the Jessup Moot. Live Law : Congrats and All the Best for the future.